You know how when you’re single, you constantly hear people say, “Just as soon as you stop looking for Mr. Right, that’s when you’ll meet him.” Well, I don’t necessarily buy into that, and yet I totally feel like that has happened over the last few days with my house/subcontractor situation. Just a few days ago, I was writing this post about how sick and tired I was of trying to find reliable people to work on my house — people who won’t stand me up, who will actually return my phone calls, who actually seem interested in the work, who seem competent enough to handle the work, etc. It became such a frustration that I finally decided to heck with it! I was just going to do it all myself! Well, as soon as I changed my whole mindset, things started happening! The most exciting thing for now is that we finally have insulation in our attic. We’ve lived without insulation in our attic the whole time we’ve been in this house. I wanted to get all of the ceilings drywalled in all of the rooms before I insulated. I was planning on using the blow-in insulation, and I was going to do it myself since it’s a fairly easy job. But I didn’t want to waste the time, effort and money when the ceilings in four of the rooms still had to come down and be re-drywalled. So we’ve been waiting. When I mentioned that in a post a couple of weeks ago, many of you recommended that I look into spray foam insulation instead. Well, I did just that, and we decided to go with it! The guy came out and gave me an estimate at the end of last week, and had told me that they were about two weeks out on scheduling new work. So I thought I was going to have to wait. Then he called Monday afternoon and said that some time in the schedule had opened up the next day (yesterday!) and he could send his guys over in the afternoon and get it done. So after almost three years of living with virtually no insulation in our attic (other than the scant 2 inches or so you see in the pic below), we finally have insulation!!! 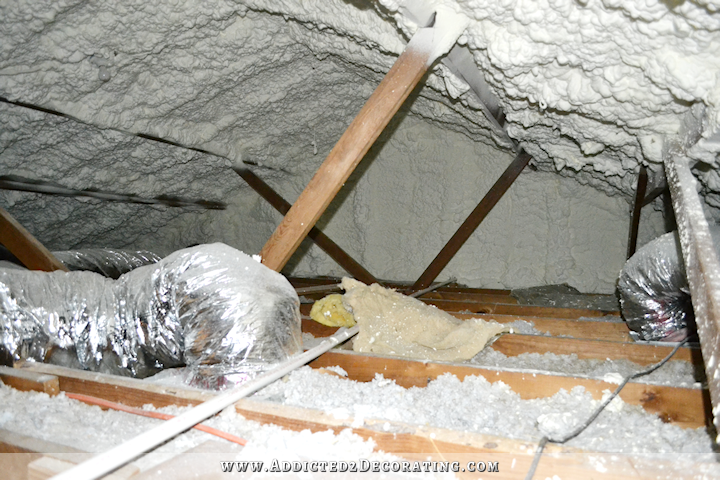 Spray foam insulation is different from the fiberglass insulation in that the foam is applied to the underside of the roof and the end walls of the attic, whereas fiberglass is applied to the “floor” of the attic. And with a spray foam insulated attic, there are no vents! Right before we moved into our house in 2013, we had the roof re-shingled. The house originally had those whirlybird attic vents, and the roofers removed those and added a ridge vent the entire length of the roof. There was also a big vent on each end wall of the attic. Well, the spray foam insulation guys sprayed right over those vents! A spray foam insulated attic is a fully sealed attic. I thought that was very interesting. He said that my attic should now only ever be about six degrees hotter than the inside of my house in the summer, which will really help my HVAC unit run more efficiently. Now, rather than that unit sitting in 140+ degree temps while trying to generate cool air to cool my house on the hottest summer days, it’ll be sitting in about 80 degree temps in the summer. 1. I can now take my time to re-drywall the other rooms, and now when I do get to them, ripping those ceilings down will have very little effect on the temps inside the house since all of the insulation will still be there, and the attic is completely sealed. 2. If I have to get up there and do any work, such a electrical work, I don’t have to dig through fiberglass insulation to run wiring. 3. I can still very easily see where to walk in the attic. Blown-in fiberglass would have covered all of the joists that can be walked on, and would have made it unsafe (at least for me) to walk around in the attic. 4. I can add boards across the ceiling joists to create an actual floor in main center part of the attic. This wasn’t possible with fiberglass since local codes require a minimum of 13 inches of fiberglass insulation. The cost of this insulation came to $3075, which is definitely quite a bit more than fiberglass insulation, but I think the benefits are well worth it. After just a couple of hours, I could tell a huge difference in the air quality in the house. I thought it might just be my imagination, so I asked Matt if he noticed any difference. He said, “YES! The air feels crisper.” That’s actually the exact word that I was thinking as well. I’ve also noticed that the temp in the house feels much more consistent from room to room. Before, there were rooms that would get cooler, and areas that would stay hotter. Now it feels consistent throughout. It’ll be very interesting to see the overall effect that this will have on our energy bill. We’ve been having unseasonably cool temperatures these last few days, and it looks like our typical 100+ degree August weather might be gone for good this year, so I’ll have to wait until next summer to make those comparisons. Just a week ago, our HVAC was running at 100% all day long, and was still only able to cool the house to 78 or 79 degrees on the hottest days. But with the rain and cooler temps these last few days, even with no insulation, our HVAC has been able to keep it down to the 73 degrees that I keep it set on during the day. So we’ll see how it does next summer. But winter is just around the corner, so we can compare those costs soon. The second winter we were in our house is when we had no working furnace and no attic insulation, and we heated our entire house with space heaters. Our electricity bill ran us $600 that January. Last winter, with our new HVAC system, five new windows in the dining room, but still no attic insulation, our electricity bill in January ran about $200. This winter we’ll have the combo of new HVAC system, new windows not only in the dining room, but also the breakfast room, plus a completely insulated attic. I’m not anxious for cold weather, but I am excited to see the difference that all of these things will make! Anyway, there’s much more going on, and it looks like some subcontractors are actually going to come through for me. I’ll share more of that in the next couple of days as things progress. It’s exciting! This is such great news. The insulation will be worth every penny. You’ll have to figure out how long it will take for your lower energy costs to pay off the insulation cost – bet it won’t be too long. Glad things have shifted!!! Yay! You deserve this! You are going to make us all want spray foam insulation! Oh my gosh, I’m so glad you were able to get things insulated. Insulation is so important to keeping a house temperature regulated! I think we are lucky our 1958 built home seems to have good insulation and our HVAC is able to keep up with cooling it well in this Texas heat! Hopefully with your home feeling more comfortable overall you may also WANT to start some of the projects you have planned or finish others. Being comfortable can make all the difference in the world when it comes down to getting work done! I know 78 is college than you had before but it’s still hot! Fantastic news! And how exciting to be able to feel the difference in your living space right away. Now there you went and got your readers all excited and anticipating your next triumph! Great news! I have a question. With a completely sealed attic how does moisture build up escape. Is there any ventilation? Presumably, there should be no moisture build up. But no, there’s no ventilation. It’s completely sealed. I was thinking the same thing! If bathroom exhaust vents into the attic and it’s completely sealed off, that can / will create some mold and moisture issues in the future. It’s a building code violation to have the bathroom exhaust vent into the attic. It’s supposed to vent outside. Insulation is not a pretty thing, and it’s costly, but it is so worth it. You’ll be so glad you’ve done this and can get the dry walling done without worrying about cool air escaping! So excited for you that things are ‘happening’. Was it priced according to square foot? If so, what is your square footage? I’m super interested in this, but I’m wondering what it would cost for my size house. It was priced per square foot, and he came out and measured, but then he didn’t list the square footage on the invoice. I would guesstimate around 1600-1800 square feet. It didn’t include the add-on areas, like the master bathroom or the huge sunroom. It was just the area under the original roof, plus the breakfast room. So did they not spray the foam in the master bedroom and the sunroom? Just trying to grasp how this works as it sounds very interesting. Master bathroom and sunroom. Those rooms were add ons. The attic space above the master bedroom is insulated. Here in Savannah most of the new homes are using the foam insulation. The air handlers and water heaters are in the attic as most houses are built on a slab. If your air handler is in the attic be sure to check if your model is ok to run in the sealed attic. My neighbors, who have the foam, say their bill is a lot lower than before the foam. Glad to hear you are progressing! Kristi I am glad that you have finally found a sub contracotr who is relaible. Too bad he only does insulation. So – when did you get the new windows in the breakfast room? That still remains to be seen. I’m waiting to see if the subcontractor that I met with yesterday (who REALLY impressed me) is going to follow through and get me the estimate that he promised he’s send me today. 🙂 Fingers crossed, because I REALLY liked him!! So you’re not going to use the ones that did your dining room windows? I thought you really liked them also. No. I actually ended up not being too happy with how they did the two windows that flank the fireplace. I’d like to find someone else. That’s fantastic! We are going to replace our HVAC unit next spring because it couldn’t cool past 82 this summer (and the heater doesn’t work at all! ), but I know we need to update our insulation as well. Thanks for providing the cost to give a ballpark of what we might expect to pay. I guess I will be waiting a little longer to see how your floor leveling goes. I know you will do a fabulous job! I used a company called Thermo Dynamics Insulation. It doesn’t look like they have a DFW location, but they might have some recommendations. Glad you have some good news! Nice to see a little weight lifted off your shoulders. Closed cell spray foam insulation is fabulous! A friend who lives in the extreme NE had her whole house foamed (new build) and it’s a BIG house. Her energy costs are less then half of her neighbors whose homes are far smaller. You and Matt are going to be living there for many years…and the cost of energy is only going to rise, cost savings will accrue faster than you think. Your personal comfort is a happy by-product. We have a really great insulated house – but one thing that I did notice, was bits of cold air was coming in near our wall plugs on the outside walls of the house. It’s a fairly new home (built in 2007), and I didn’t think that this would or should be an issue. But I looked it up, and it’s fairly common. Especially if you have newer more efficient windows, the outside air is more likely to find SOME way of getting in, and in our case, it was the outside wall electrical plugs. I bought a kit from Amazon that had foam insulator cutouts for the wall plugs, that go behind the faceplate. I seriously could not believe how much of a difference it made! What a wonderful update!! Good job! Awww, that’s awesome that you finally are getting somewhere! No attic ventilation blows my mind though. Completely opposite of the mindset around here in the lower Midwest. Hope some of your other contractors will begin coming through for you now. We had an energy audit done and the guy said he recommends this type of insulation-called a hot roof. So glad for you. Your HVAC and attic insulation issues are SO similar to ours… and I can’t tell you how happy I was to read this update from you… not only for your sake, but for ours! We have also been going back and forth a few years now about what vents, insulation, and/or barriers we should purchase for our attic… because we also suffer hot/cold spots in the house… and this foam installation seems like a perfect solution! We’ve been thinking of having this done to our attic. I think you’re helping me decide to go for it!! I’m so glad some contractors are working out for you finally! Sometimes I find just an extra pair of hands can get my motivation going again. Can’t wait to see what you have in store for us next! This is so exciting! I can’t wait to hear how this affects your temp consistency and power bills in the long run. FINALLY, YAY! Having worked for a rural electric cooperative for 32 years, this was a big concern of mine with your house. I’m so happy for you! Wonderful news, you must be so very happy now that someone has turned up. It will certainly make a huge difference to you both. This is fantastic news! So happy for you guys! I mentioned this to my husband, as we are thinking of doing spray foam insulation in our crawl space – did you ever think of doing this as a DIY project? My husband said he wanted to do it himself, but that scares me a bit… just wondering if you had looked into it at all? That looks like a good product, but I’d still be hesitant to DIY my attic. I’d have no problem doing my own walls, though. In fact, I may look into this for the rest of the exterior walls that still need insulation. I think you will be much happier with consistent cooling/heating and lower energy bills. Good for you! It will make working on your home so much better also. When we were renovating my grandma’s house I just couldn’t believe how hard it was to find contractors who wanted to work and get paid for it lol It was just nuts! I felt like I was practically begging to pay someone to come out and do what their business advertised it would do *shakes head* we didn’t hire much out though but it was still really crazy annoying. We also did spray foam and, just like you said, it was much more expensive but I don’t regret it at all, with our 100 year old home we just didn’t have any choice but to do all of the ceilings and all of the outside walls because the walls were only 4 inches thick (rough cut ancient 2x4s) but it really seemed to work out and I would recommend it to anyone! So glad to hear your project is moving forward! Doesn’t it feel good!? I know you are not a contractor, and every situation is different (especially in older homes, different climates). If you learned extra details to look out for, so a space can be DIY prepped I know I’d appreciate it. I’m looking at replacing my roof in the near future. This maybe added for the next expensive improvement to save for, but looking into ways to cut the cost down on it and gotchya’s. On the old insulation, what your plans? I actually didn’t ask about the HVAC unit. I figured if it’s safe to be inside a house (i.e., inside a closet in the house), then it’s safe to be inside the attic when the attic is now going to be much cooler in the summer and much warmer in the winter. When I describe the attic as being sealed, that doesn’t mean it’s airtight. It basically means that it as become like an upstairs room in the house. The temperature in the attic will be similar to that inside the house. The only old insulation left in the attic is the stuff that’s sitting on the ceilings in the rooms that haven’t been redrywalled yet — Matt’s game room, my office, our bedroom, and the breakfast room. Once that old drywall is removed and new drywall installed, there won’t be any more old insulation in the attic. I’m a bit jealous that your 100 degree days are (probably) behind you We’ll still have them (probably) into October. Boo! Glad things are on an upswing!